Is there anything better than brunch after waking up late on a Sunday morning? Our editors know a thing or two about this beloved meal. 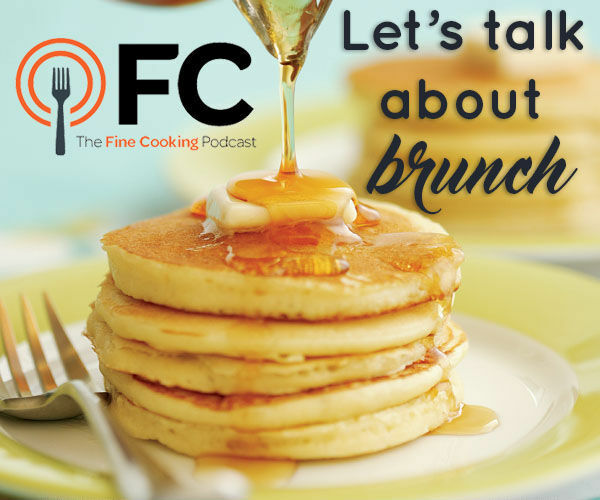 In this week’s episode of The Fine Cooking Podcast, we discuss all of our go-to recipes, from a made-to-order waffle station, to make-ahead frittatas. Chris is cooking his way through Abby Dodge’s Everyday Baker. He also talks about her Hot Cross Buns recipe, which is a variation of her dinner rolls. Sarah is making French Onion Soup burgers inspired by Le Rivage Restaurant in NYC. Top a basic burger with a slice of Emmentaler cheese, caramelized onions, and a bechamel sauce with shredded gruyere stirred in (you can use the croque madame recipe as a template). Serve it on a large toasted English muffin. Diana has been making ginger muffins from Marion Cunningham’s The Breakfast Book, while Kathy has been creating her own miso butter. Here is a template for Kathy’s miso butter, though hers has a touch of honey and vinegar instead of truffle. These waffles are our go-to. And the editors ALL love Denise Mickelsen’s classic pancakes. We also like to add in coffee cake, classic scones, and ham and cheddar muffins. Sarah loves doing a whole roasted ham at the centerpiece of a brunch buffet with assorted chutneys and mustards, and buttermilk biscuits, or a poached or roasted side of salmon. If you’re looking to make eggs Benedict: here’s our recipe. Try these two tips to simplify: make an easy blender hollandaise, as in this recipe and keep it warm in a Thermos, so there’s no risk of the sauce breaking. How to use leftover croissants? Diana suggests cutting them into cubes and toasting them for croutons, or using them in this croissant bread pudding. How to keep rolls warm at the table—Chris has a genius idea of using ceramic pie weights in a bread basket (just wrap them in a kitchen towel) to keep your bread and rolls warm. How to keep bundt cakes from sticking? Here’s a better way to grease a bundt pan. Fine Cooking Magazine is simply THE best one on the market. I’ve yet to try a recipe that didn’t turn out well, and, I love your tips and where to buy some of the products. This is the first time I’ve listened to the pod cast and really enjoyed it. You’re all so delightful and sweet. I’m an old grandma & have been entertaining for years but love learning new foods and ways to serve. Keep up the good work, kids!